Oceanic has taken the same technology behind the Vortex series and extended it to the world's most efficient fin! The technological edge is achieved with the Patented Nature's Wing Technology by Splitting the Blade to Generate Highly Efficient Thrust or Lift like an Airplane Wing, while reducing the Strain on the Muscles of the Leg and Hips by allowing the water to drain between the Dual Blades. With the V12, Oceanic's design team has worked long and hard to create just the right combination of fin size, shape, and angle. Then added Duoprene a Proprietary Combination of Natural Rubbers and Hi-Tech Polymers to Fully Maximize this new Technology and create the Ultimate Fin. The Oversized Rails add Rigidity to the Oversized Blade for Increased Lift and Efficiency. The Ergonomically Designed Foot Pocket accommodates virtually all foot sizes and boot styles and the Angled Blade provide the Preferred Angle of Attack. Donning and Doffing is made easy with the Quick-Adjust Straps with Squeeze Style" Quick-Release Buckles and Large Pull-Tab Thumb Loops in Straps for Grip. The Pull-Tab Thumb Loops also allow a convenient manner to hang your fins when drying and for storage. The Nature's Wing Technology is so efficient that it can also Improved Speed Underwater, Improved Surface Swimming and can give 20% to 40% Better Air Consumption! The Vortex V12 Split Fins are available in 4 sizes of X-Small, Small, Medium or X-Large, weighs from 5.68 to 7.30 lbs (2 .58 to 3.31 kg) depending on size. The Oceanic Vortex V12 Split Fins is commonly used for Recreation, SCUBA, Snorkeling, Travel and more. The Oceanic Vortex V12 Split Fins is most used by customers who consider themselves to be a Advanced, Advanced Diver, Beginner, Casual/ Recreational among others. 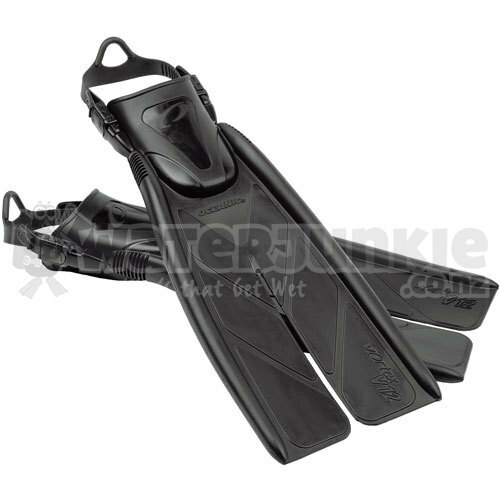 The Oceanic Vortex V12 Split Fins is popular because customers like the following qualities of the Oceanic Vortex V12 Split Fins: Accommodates Boots, Comfortable, Efficient, Lightweight.